Day One: This is the 4th peel in a series of 7, the third one I’ve done at home, and I have Fraxel Re:store Dual laser treatment scheduled for 2 weeks from today. It’s been 15 days since my last chemical peel. I’ll be suspending these peels until the doctor advises to begin them again, post laser treatment, so this is my last home peel for a while, although my intention is to finish the course of peels once it is safe to do so. This time, I began by applying 2 heavy layers of Vitalize peel with medium pressure, using a cotton ball. The second layer had a lot of tingle to it, more than I remember experiencing in the past, so I waited 9 minutes before the next application, allowing my skin some time to calm down. The third layer of Vitalize was “dotted” over my problem areas only, and very lightly. Waited another 5 minutes after the final “dotted” layer of Vitalize, and then applied 1 layer of 20 drops of TCA 12% (did not dilute it this time), applied by using a fresh cotton swab. Tingled big time, and a light frosting appeared on my forehead only a few minutes post application. First time I’ve ever seen frosting on me. Skin felt tingly and slightly numb for next 2-3 hours, then felt normal for the rest of the day (although slightly “tight” despite light layers of Aquaphor to stay moisturized). By bedtime, I could see a slightly reddish tint to the skin that had been treated by the peel. Day Two: You can see a pinkish mask of skin where the peel was applied yesterday. It disappears under normal makeup and isn’t very noticable unless you’re looking for it. Looks like a mild sunburn in a very specific pattern, if that makes sense. Those small clear & glassy lines are beginning to appear, as is usual for day two. Using SPF every few hours, and wearing an oversized hat while out and about. Skin still feels a little dry, so I’ve been using Aquaphor in thin layers when at home (and not wearing makeup). Day Three: Woke up to massive peeling around the mouth and chin. Looks like the kind of peel you get after a sunburn, it’s not painful or worrisome but it is very present today and moisturizer alone won’t hide it. The pinkish tint to the skin is gone. I’m applying Aquaphor to keep the skin super-hydrated and trying to keep myself from touching my face. Thou Shalt Not Pick Thy Skin, Lest Ye Cause Damage and Scars! My commandment for the day, but it’s hard not to rub the skin because it feels so delightfully weird. This is definitely the most significant peel I’ve experienced in the series, and I’m happy to find a process that evoked the results I wanted. In other spots, you can see the mask of skin that will be peeling soon – it looks like I have on one of those old clear gel masques (the kind you would peel off when it dries). Before you peel those off, they dry into a clear masque of wrinkly skin. That’s what my skin looks like up close, eeny weeny clear wrinkles everywhere. It doesn’t itch though, and I’m excited to see what new skin will be revealed once the peel is complete. Day Four: Woke up to massive forehead peeling, and unlike all my previous peels, this isn’t tiny litte flakes. It’s like a sunburn peel, that’s all I can compare it to. I’ve heard other happy chem peelers talk about a good peel resulting in a “snake like” peeling, so I guess this is the molting they’ve referred to. I can gently coax off 1/4″ pieces that are as long as the width of a dime. I don’t peel! Never never do I lift the skin off my face, it’s bad and can scar you! Had to work and so I wore makeup in evening, forehead had the worst noticable peeling but bangs saved the day. Looked like my bangs had dandruff though. Doesn’t itch, but it is hard to keep your fingers from picking. I slather in Aquaphor every moment I’m at home, and no makeup on. The new skin beneath is really smooth and lovely. I’m looking forward to a week from today. Very hopeful! Day Five: Peeling is almost done now, but flaking continues. Not much to say today. Looking good, getting closer to normal. Summation: This was my most successful peel, and it took me 3 tries to work my way into the strength I required to achieve the results. The downside is areas which peeled greater than others have beautiful pink skin “blotches” but they blend into my non-peeled normal skin. It’s not noticable unless you’re 3 inches from the bathroom mirror, examining your skin, like I do. Pores are reduced, definitely. And the other morning, I walked by a mirror and noticed the pink glow to my radiant skin, and smiled. If it weren’t for the dark circles under my eyes, I could consider not using foundation. As it is, the peels are doing a great job of removing sun damaged layers of skin. No more peels for a long time, but check back near the 15th for my Fraxel Re:store Dual laser treatment reports, m’kay? I’m going to try to vlog the results, along with the blog. Day One: This is the 3rd peel in a series of 7, using Vitalize (3 light layers, spaced 2 minutes apart) and TCA 8% (1 light layer). It’s been 13 days since my last home peel. Upon application, the TCA burned more than expected for the first minute, but no frosting. I’ve never seen frosting on me though. After 5 minutes, I applied baking soda paste to neutralize, but it might not have been necessary. I’ve read it is self-neutralizing, but I thought to play it safe for my first use of the chemical. Immediately afterwards, skin felt slightly tingly for an hour, slightly numb to the touch, then normal all day, ever so slightly pink. Day Two: Skin looks slightly tight and glassy in places, mostly near the mouth, with eeny weeny small lines. No other changes. Day Three: Woke up to some slight flaking near the mouth. Afternoon showed good rubbing… this is when I apply a heavy moiturizer, or even Aquaphor, and then use my fingertips and rub them over my skin. Small bits of dead skin roll together as I rub the skin, resulting in a very gentle exfoliation using nothing more than oil and the texture of my fingerprints. Day Four: I had to work outside all day for a Renaissance Faire but I was in the shade for the most part, and I SPFd and tried to stay out of sun by keeping my back to it all day. Had some light peeling on left cheek after my shower that night. This ended up being the most significant peeling I saw during this home procedure. Day Five: Outside all day for Renn Faire again, SPFd again and tried to stay out of sun. No sunburn from yesterday. Light peeling on forehead after shower. Day Six: Woke up to more light forehead peeling. No sunburn. Summation: I peeled for longer during this run, which shows more of the exfoliation power of the addition of the TCA after the Vitalize. I’m not seeing much in terms of results, but patches of my skin along my cheeks looks very fresh and new. The sun spots look the same as ever, maybe slightly lighter, but not certain. Next time, I plan to use the TCA at full strength (12%) instead of diluting it. It’s no secret to blog readers how obsessed I am with skin care. In this quest, I’ve just added a new element to my skin care regimen: chemical peels. It began with an in-office peel I did in August, which I blogged about here. My formal diary didn’t begin until several peels later, but I’ve gone back to recreate some of my experiences, and I’ve used my notes (yes, I keep written notes on days, times, procedures, and results) to use as a resource for these diaries. My hope is that by sharing my experience, I can help add to the pool of knowledge that exists for others to draw from when embarking on their own journeys with DIY chemical peels. Day One: This is the 2nd peel in a series of 7, and my first attempt at using the Vitalize peel at home. It’s also my first home chemical peel, and I was nervous but believed in the research I conducted. It’s been 12 days since my last peel, which was done in-office. I followed instructions on how to properly cleanse the skin using the professional preperation solution. I applied lip balm to my lips, and then a light layer around the orbital socket of the eye, including the skin above and below the eyelid itself. The lips and the eye socket should be protected during a peel, and should never be exposed to the chemicals. I used about 15 drops of the Vitalize peel and saturated one cotton ball with solution. I used light and quick strokes, applying from the forehead to the temples, the cheekbones, the cheeks, the chin, upper lip and lastly, the nose. Within about 30-60 seconds, there is a tingle to the skin, like a light prickling feeling, and I can notice a faint, strange smell in the air as the chemicals continue to react to your skin. I hand-fanned my skin, and waited 5 minutes for the skin to stop reacting as the peel self-neutralized. Then, I repeated this procedure for a second time. No frosting, and only a few very light pink patches immediately after application, but very small and unnoticable. Day Two: No effect. I figure it’s too early to tell. The in-office procedures all say to wait 3-5 days to see the peel. Using tons of SPF lotion and wearing hats religiously. Day Three: Nothing but a few flakes, and I mean a very few, around the corners of the mouth. Summation: I continued to see no other signs of peeling, and doing further research decided to add a secondary peeling acid, TCA (trichloroacetic acid), to mimic the retinoic acid used after the Vitalize peel when at the doctor’s office. 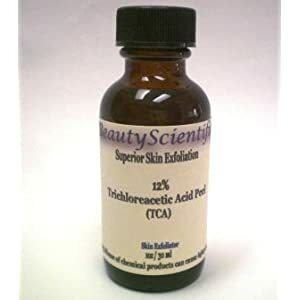 I bought a 12% solution, and plan to dilute the acid to 8% for my first application so that I can ease into usage, and gauge how my skin reacts to the TCA. It’s been a while since I’ve done any blogging about my skin care resolutions. I’ve taken some drastic steps of late (well, drastic to me). Last month, I splurged on a Vitalize facial peel from the doctor’s office. I hoped for more than the experience provided, honestly. I hardly peeled at all, and the entire experience didn’t bring the radiance and clarity I was hoping for, but I’ve been told that for the best results, a series of 3-6 peels is best. At over $150 a pop? Not in my budget. Here is where we must talk softly, because I’ve ventured into DIY land. Vitalize facial peels are sold on ebay, but without the retinoic acid, because that’s only sold to doctors. Vitalize is a mixture of lactic and salycic acids, which provide a light peel on their own (called a “lunchtime peel” since they require little to no downtime). For better results, these “combination peels” are followed up by a different acid (usually retinoic acid in the Dr.’s office) which cause the most peeling action, and penetrates slightly deeper. My first venture in home facial peels was to apply the Vitalize I bought (and it wasn’t cheap, even on ebay), just by itself. I was very nervous, and applied 2 light coats of the Vitalize peel, and felt the burn the same as the doctor’s office. However, I barely peeled or flaked at all, so after doing some more research from other DIYers, I’ve found adding a peeling acid can help you get the most from the peel. TCA (trichloroacetic acid) is sold on amazon.com at various strengths, and decent prices. TCA is the active ingredient in the popular Obagi Blue Peel, and when used at 20% (or even 25%) can provide what is known as a “medium peel,” meaning it penetrates deeper than the light, “lunchtime” peels, and requires a bit more recovery time. But I’m not that ballsy. I bought the 12% TCA and plan to dilute it to about 8% with distilled water to use for my next DIY treatment. For combination peels, you don’t want to shoot for the moon, and caution is good in my world. This is acid that we are putting on our face, after all. And I should mention, I’ve waited 2 weeks between each peel, and my intention is to continue the peels over the next 2 months, so results will be ongoing still. Two to three weeks between peels is what my doctor recommended for in-office work, and at this point, I’ve never needed downtime to recover (my peels have all been very light). 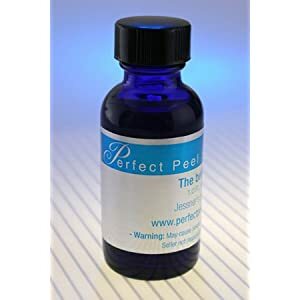 For others who want to research their own DIY facial peels, you may wish to look into Jessner’s, which is a combination peel also sold on amazon.com, and it contains slightly higher percentages of the salycic and lactic acids than the Vitalize version but at a much more affordable cost. 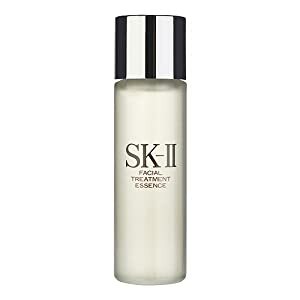 Lastly, the skin care experiment wouldn’t be complete without a new miracle water, so I gave in and bought a sample sized bottle of SK II Facial Treatment Essence. Hyped for its anti-aging and pore reducing qualities, SK II is loaded with “pitera,” derived from sake wine and touted as, literally, miracle water. Insanely expensive at retail, I found a sealed sample on ebay and nabbed that instead. My bottle arrived yesterday, I’ve used it twice. It feels nice and light, velvety smooth, and tightens the skin without making it feel dried out. Miracles? Not yet, but let’s give it time. At the very least, I figured it would soothe the new skin that I’m revealing through the peels. Before I go, I want to add that doing home peels takes steady nerves, prevailing logic and common sense, as well as some cojones. If you do take on the challenges yourself, remember… go slowly. Patch test, especially if you’ve never had peels done in a professional setting. And for goodness sake, keep your delicate face out of the sun! I’ve discontinued using all other retinol products (including my tretinoin night cream, too harsh), have been using a higher SPF daily, and wearing hats religiously to protect my face from sun damage. Be careful, use your common sense, and then go for it! I’ll keep you posted on my results!